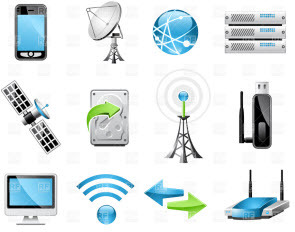 Communication systems play a major role in maintaining communication between humans or organizations or institutions or even people get entertainment programs or news or other television or radio broadcasting programs via wired or wireless communication systems. To overcome disadvantages of wired communications, advancement in technology has resulted in the development of most advanced wireless communication systems including wireless radio frequency technology, infrared technology, GSM technology, and so on. These wireless communication systems can be used to transmit different types of signals from transmitting end to receiving end. The control signal from transmitter is sent to the receiver which is connected to an object or device or vehicle that is to be remotely controlled. For example, IR remote is used to control TV remotely. Similarly, this article mentions about a wirelessly controlled robot controlled using radio frequency technology. The rate of oscillation of frequency of alternating currents and radio waves which carry radio waves in the frequency range of 3 kHz to 300 GHz is called as radio frequency. 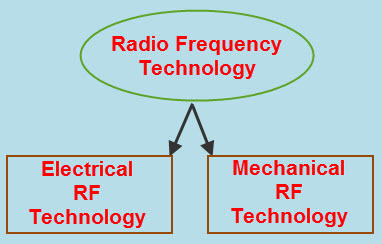 Radio frequency technology is divided into two types: mechanical radio frequency technology (like radio frequency MEMS and mechanical filter) and electrical radio frequency technology. If you consider, electrical radio frequency technology, the RF currents have some special properties. The basis of wireless radio frequency is electromagnetic waves or radio waves radiated off from a conductor into space as electromagnetic waves or radio waves using the energy in RF current. Radio frequency remote consists of transmitter at the transmitter end and a receiver at the receiver end connected, which is connected to a remote circuit that is to be controlled. A control signal is transferred from transmitter end in the form of electromagnetic waves or radio waves such that to control the device remotely, which is connected to the receiver end. This control signal is transmitted using electromagnetic waves or radio waves of radio frequency. Thus, the control signal received at the receiver end can be used to control any object such as robotic vehicle, special purpose robot, communication purpose device, and so on. Radio frequency controlled robotic vehicle is designed using a robotic vehicle that is interfaced with radio frequency remote control. RF transmitter is used by control panel or controlling person and RF receiver is connected to the robotic vehicle that is to be controlled remotely. Radio frequency remote control works over an adequate range (upto 200 meters) by facilitating with proper antenna. 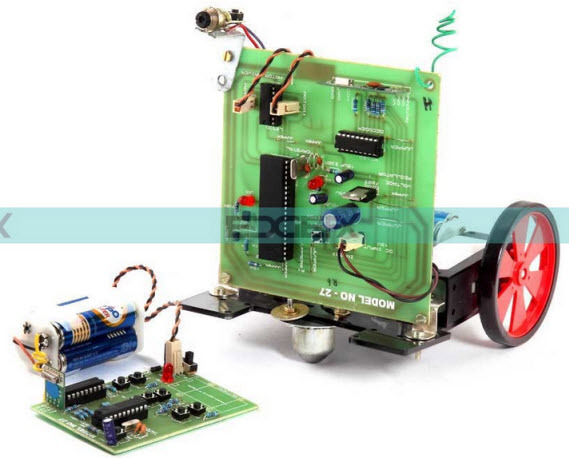 This RF remote control robotic vehicle project explains how a robotic vehicle can be controlled using radio frequency remote control technology. In this project, for a demonstration purpose, a low-power laser light interfaced with the 8051 microcontroller is used for showing the potentials of destroying or diffusing a distant object. Before discussing about the working of the radio frequency controlled wireless robot, we must know about the RF modules such as RF transmitter modules and RF receiver modules. RF modules are usually very small in size and operate with voltage range of 3V to 12V. 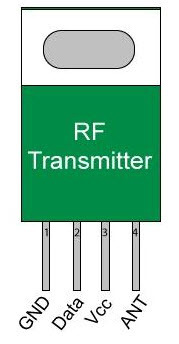 RF transmitter modules are designed to work with 433MHz frequency. If transmitting logic is zero, then no power is drawn by transmitter (consumes very low power if carrier frequency is fully suppressed). 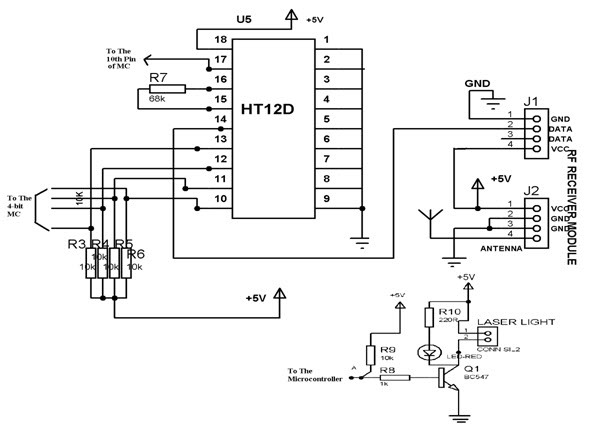 For transmitting logic one, it consumes power about 4.5mA with 3V. 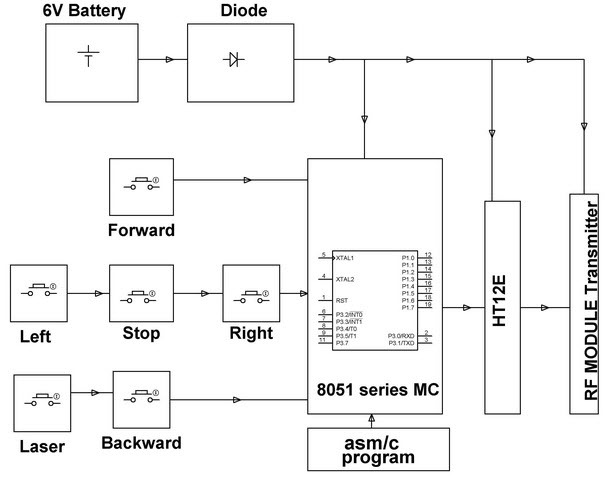 The transmitter and receiver are interfaced with 8051 microcontroller for desired operation. RF transmitter has supply voltage in the range of 3V to 6V and output power in the range of 4V to 12V with frequency of 433.92MHz. RF transmitter circuit diagram is shown in the figure that shows different push buttons used to move the robotic vehicle in different directions like forward, backward, left and right. Thus, by pressing the appropriate push button, we can control the robotic vehicle’s movement. 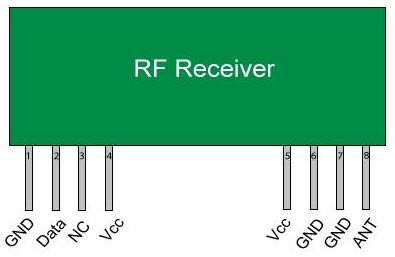 RF receiver modules are also designed to work with 433MHz (that should match with the transmitter frequency for communication purpose to receive signals from the transmitter). RF receiver has supply current of 3.5mA with an operating voltage of 5V and a frequency of 433MHz. RF transmitter circuit diagram is shown in the figure. By using the push buttons of transmitter, we can send commands to the receiver for controlling the movement of the wireless robotic vehicle. The receiver and two motors used for movement of robot are interfaced to the microcontroller of the robotic vehicle. The transmitter encodes the input commands given by the controller and transmits the encoded data using radio frequency. This encoded data transmitted from the RF transmitter is received by the receiver at the receiving end, which is connected to the robotic vehicle. The receiver consists of RF antenna designed to work over an adequate range of 200 meters. 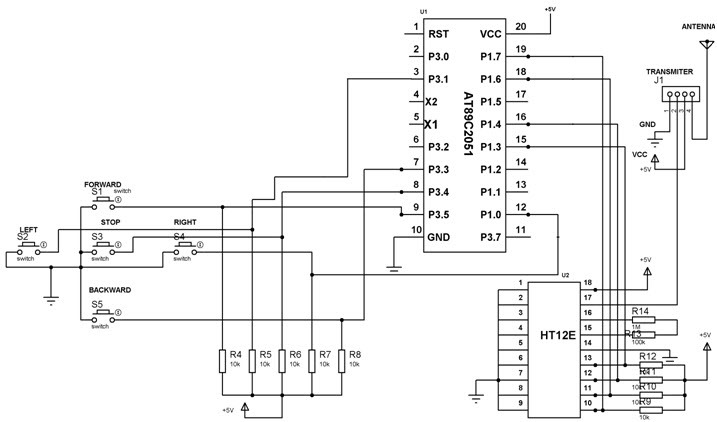 This, receiver after receiving the data from the transmitter, decodes the data and sends it to another microcontroller for driving the DC motors using a motor-driver IC to move the robotic vehicle. 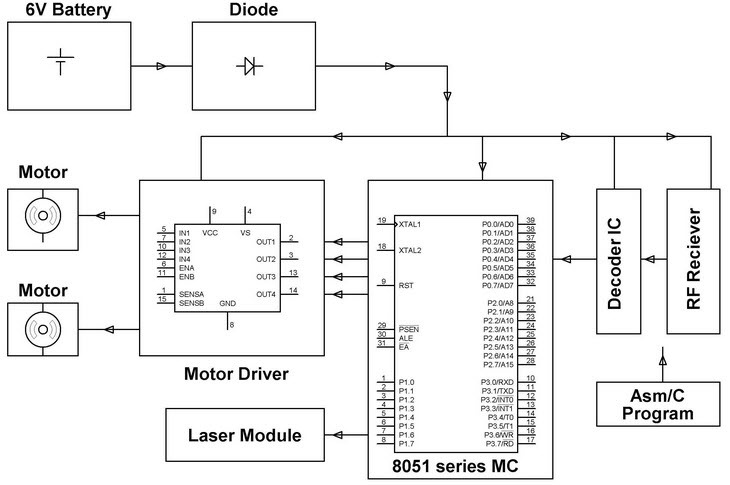 A laser pen mounted on the robotic vehicle can be operated using output from the microcontroller based on the signal received from the transmitter. This wireless robotic can be controlled using other wireless technologies such as DTMF technology; for controlling the robot using a mobile phone, we can operate the robot over long range. The above discussed radio frequency controlled wireless robot is a basic application of radio frequency remote control that can be used for different purposes in industries, military, and so on. The radio frequency remote control can be used for controlling the robot wirelessly. Are you interested in designing electronics projects with your own innovative ideas? If yes, then you can download our free eBook of practical guide to build electronics projects on your own that helps you to improve your technical and practical knowledge. I want this project as my final year project. I am having problem with the programming part. Can I get the code you have used?